eXo Platform features some ways for you to do actions on your content flexibly, regardless of in which view you are using. In the Icons view, you can right-click the content that shows a drop-down menu. In the List view, you cannot right-click the content. Instead, click anywhere under a specific area of the content (marked with the ticked checkbox). You will see a list of actions on the Action bar that are similar to those from the Right-click menu. 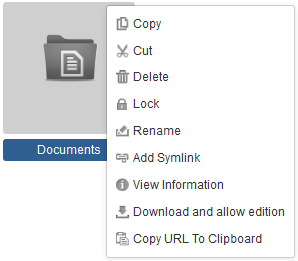 Depending on the display width of your device, some actions (for example, Download And Allow Edition and Copy URL To Clipboard) may be grouped in the More drop-down menu. The available actions shown in the Action bar when you double-click the content in the Icons view are quite similar to those when you click directly the content title in the List view. The difference is that the Overload Thumbnail function is only featured in the Icons view.